Thank you for your interest in Brazilian Blowout™, the most amazing, globally recognized treatment that eliminates frizz – and smoothes and straightens the hair within 90 minutes. It’s been featured on ABC, FOX and E TV and in national magazines like Allure, Bazaar, Redbook and Prevention. We’re thrilled that INDULGE has more experience in this fabulous service than any other salon in the York area. If you have really coarse, frizzy, rebellious hair you know what I’m talking about. Frizzy hair is hard to blow dry and get silky smooth, especially on those high humidity days. Ugh! Brazilian Blowout™ can be done on color treated hair, on the same day your hair is colored. Even more extraordinary, it’s a healing treatment because it mends damaged hair. Shampoo the next day without problem! Brazilian Blowout™ makes your hair feel normal because it has a natural polymer that adheres to each and every strand. You can wash it right away without any worries and, depending on how you care for your hair, the treatment lasts 8 to12 weeks. Key ingredients include Acai Berry, Anut Anut (which is a nut), Camu, plus a special Super Nutrient Complex. The only way it works is with heat that drives everything into the hair. The entire process only takes about 90 minutes. In fact, we normally have two stylists working on your hair at the same time – to save you time. INDULGE is certified by the Brazilian Blowout™ company and Kimberly is being educated as an authorized Brazilian Blowout™ trainer, to work with other salons. We are very efficient in our methods to protect the hair and prevent any damage. This is not like the Japanese straighteners. There is virtually no formaldehyde* or any kind of “hyde” derivative for that matter. No harmful chemicals. Brazilian Blowout hair products are a patented resource that’s healthy for hair everywhere. It lasts 8-12 weeks with no frizz! 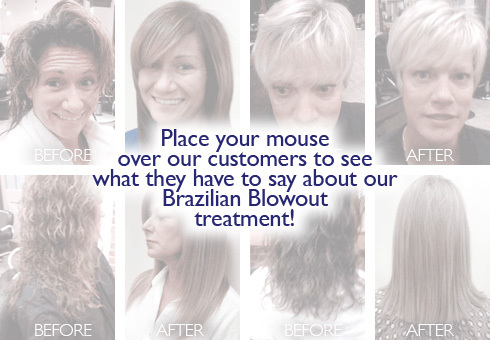 INDULGE clients who have tried Brazilian Blowout™ have been raving about the results. They love the way their hair looks and feels, how easy it is to maintain, and the fact their color lasts longer than usual thanks to that protective barrier around the actual hair shaft. We also offer the products that will help your Brazilian Blowout™ stay in longer. We especially recommend the Brazilian Blowout™ Masque because it has the most concentrated super nutrient complex, and provides a continual and cumulative smoothing effect as your hair is washed and styled between professional treatments. INDULGE also offers the complete line of Acai Aftercare products from the shampoo and conditioner to a wonderful serum that you can leave in the hair before you blow it dry. If you are using a good shampoo without sulfates you will be fine, but the masque (which runs $40.00) will truly make a difference in your hair. Use just a little at first then step it up during the 6-12 weeks before your next Brazilian Blowout™ treatment. In addition, you’ll just love the fragrance! If you are sick and tired of your frizzy, over-processed, rebellious hair, fill out the form at right and receive a $50.00 Coupon, via email, towards your first Brazilian Blowout™ treatment. Just remember that the coupon must be used within two weeks after it’s downloaded to your computer. I just wanted to say that I LOVE the brazilian blowout!!!!! My hair is now so silky and smooth and feels so much lighter and it’s true I’m not spending hours blowdrying my hair, its dry within a matter of minutes. Click here to order Brazilian Blowout Hair Products Now!